Police respond to approximately 38 million alarm activations annually, but despite the large number of calls, only one in seven businesses has any kind of alarm system in place. So if 38 million seems high, just think about how many alarm activations should be going out. More businesses are in need of a commercial security system now than ever before. Plus, recent advances in technology has made these business security systems incredibly effective. However, at a time when businesses need to cut costs at all costs, many business owners will avoid any additional expenses. For those skeptics, here are five benefits of commercial security systems for businesses. Most insurance companies require that businesses install some form of security system on their property. Beyond being a requirement, it could actually reduce your premium, as insurance companies are more likely to offer discounts when commercial security systems are in place. With a security and video surveillance system, it will be much more difficult for customers to make fraudulent claims against your business. When using video surveillance correctly, it should be a simple task to falsify a claim made against you. One of the biggest benefits of having a security system in place is its ability to deter shoplifters. By simply placing a sign that alerts customers to the presence of cameras at the entrance of the store, you may experience a decrease in attempted customer theft overnight. 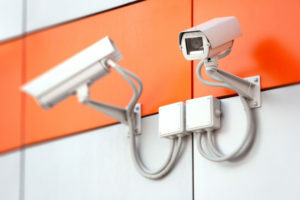 Businesses in need of a commercial security system aren’t just looking for video surveillance, they’re looking for a system that can actively keep unauthorized individuals out. High quality alarm systems and security doors can aid in preventing unauthorized entry to a store. When something does go down, you’ll know the police will be notified right away. An estimated 34.5% of inventory shrinkage can be attributed to employee theft, but a security system can contribute to a decrease in that figure. By monitoring employees as they do their work, it’s easier to pinpoint where theft is occurring and apprehend the individuals responsible. And when employees know they’re on camera, they’re less likely to develop light fingers in the first place. Protecting your business is just as important as protecting your home, if not more so. In order to profit from the investment you made in your business, you need to be willing to invest to protect it. These five benefits, and many more, are the result of commercial security systems in businesses across the country.